Some of the best places you will stay on a big lap are free camps. Free camping to us means we are self sufficient without any outside source of power and water. With the setup on our JURGENS we can free camp for up to 7 days depending on battery use and weather conditions for solar. We generally run out of water before food and battery power. This will vary for every family and the setup they have in their van. Depending on what time of year you leave and where you leave from will depend on how much free camping you will do. We found that it's very weather dependant, if it's to darn hot, you will be craving a powered site and a fresh pool. If it's to cold, you will be hanging inside with the heater pumping. Either way, we found that if your not going to be comfortable while free camping, then whats the point? So be sure to get a setup that suits your family's needs and will have you satisfied and content. +After doing a fair bit of free camping on our travels, we have NEVER had any issues, if anything we have found them very social and inviting. There are some dodgy looking campsites around though and we have found reading the comments and reviews by other campers on WIKICAMPS to be very helpful in making a decision wether to stay or not. +Not true! We thought it too at first, but its a misconception! If you head to any info centre or have apps such as WikiCamps, you'll find that there is plenty of access points to dump your loo and fill up water. Depending on your setup you might not even need to recharge your batteries. 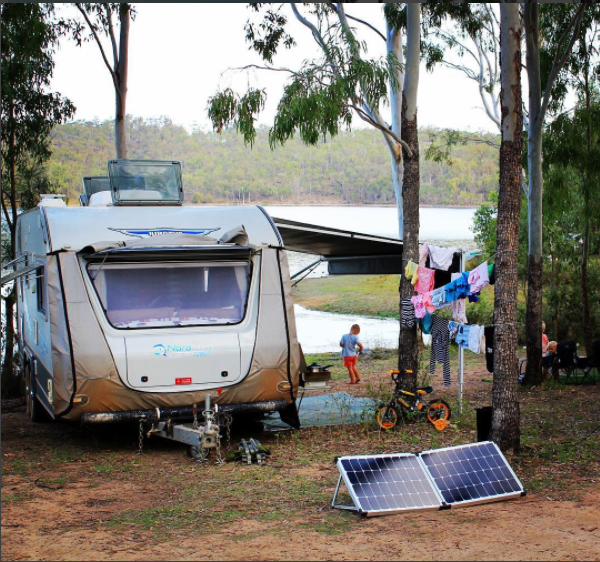 We like staying in a caravan park after a week of free camping as it's a great place for us to get a bit of work done while the kids get to have an awesome time using the caravan park facilities. +This can be true, a lot of free camps don't have facilities close by and those ones aren't really suited to our families needs. We would much rather visit an amazing caravan park on the beach, than stay half an hour away in the dirt just to save a few bucks. +We've had some of our most treasured memories at free camps and the kids are never bored. (because we pick good ones) Always a tree to climb, beach to explore, trail to walk and mountain to hike. Thats what I call an adventure! +With free camping on the rise among travellers they're very happy to make a saving in accomodation and spend within the local towns. If we free camp, we will often go into that town, go to a cafe, purchase groceries, fill up with diesel and do an attraction - now I think thats giving back to the community yeah! CLICK BELOW TO READ ABOUT OUR SOLAR SET UP, WHAT WE USE IT FOR AND HOW LONG IT LASTS. BELOW ARE SOME OF OUR FAVOURITE FREE CAMPS THAT WE HAVE HIT ON OUR TRAVELS!! Epic remote beach camp on the west coast of Cape York, Qld Australia. Plenty of fishing action! Red Bluff, WA is unbelievable. With epic views and some serious surf. We tow a hybrid caravan up the old telegraph track, Cape York. Waterfalls and swimming holes!! What a fantastic campground to explore Florence Falls and Buley rock holes. Only $6.60 per adult and kids under 5 are free!!! We found a great spot to camp for a night near Lake Argyle in Kunnunnurra, Western Australia. A great creekside camp with a good view and some crystal clear rapids. Our first night camping on the Old Tele Track. What an absolute ripper. Right on the creek with crystal clear water and Rapids. A few beers and a campfire make this the ultimate Campsite. An epic beach camp near the tip of Cape York. Easy to get to, great fishing and it's a free camp!! So Good! A fantastic beach front camp in the National Park at Cape hillsborough. Smalleys Beach was only $12.30 a night for us to camp here. Great fishing at high tide, heaps of cool shells on the beach as well. Located between Airlie Beach and Mackay. Love it!! Beach front camp for only $10 a night!! Love it. This place is called Carmila Beach and its only about an hour south of Mackay in QLD. Public toilets, bins, dump point and a boat ramp down the road. We reckon its a ripper!! An absolute beauty for $10 a night. A swimming pool, playground, toilets and showers and acres of green grass to camp on! This one is a ripper for an overnighter! THE ROCKY RIPPER!! This is one of the best free camps for being so close to the centre of town and all the shops and facilities. The most magical free camp in Australia!! We spent 2 nights here absolutely in Awe of Uluru and how beautiful it is. An Epic South Coast NSW campground. Check this out for a cool campground!! Great spot to chill out on the South Coast of NSW.